Welcome to Rentapen the Weld Fixture Specialists! If you are a Manufacturing Engineering Manager or a Purchasing Manager you have come to the right place. Rentapen is a machine design company that is dedicated to reducing costs in Weld Fixtures for manufacturers. We serve to eliminate your worries about going over budget, frustrations with finding & maintaining skilled staff, and concerns over being able to get your jobs done on time. Worried about going over budget? When we provide you a quote, you know what your costs will be. And because we have been designing machines for many years we know how to do it so that your build costs are reduced. We use purchased components wherever possible. That saves time, reduces errors, and saves YOU money! Frustrated with finding and maintaining skilled staff? Tap into our experienced and trained Machine Design Engineers. We can provide you the skilled staff when you need it and then we keep ourselves occupied elsewhere when you don’t need us. You SAVE all the time, money and frustration of finding, recruiting, training, and MAINTAINING a team of skilled engineers. Stop the frustration! Our engineers learn your standards and preferences; it is all documented! So the next time we do a project for you, we are ready. Stop the frustration! We can work time and material or give you a quote. It’s your choice. Contact us today! Concerned with getting the project done ON TIME? Rentapen has developed systems and processes to speed up the design process. We have check off lists to make sure every step of the way we are doing what we need to do to make sure the job is done to your specifications and without time-consuming errors. We send you images and updates along the way so you can see our progress and have input on the design. You will find it comfortable and easy to work with our Engineering Team. We design purchased components in wherever possible because it has been shown that it is cheaper and faster to use a purchased product than to manufacture a part in house. Rentapen’s Zero Defect Engineering Process™ save you time and money! Our RAPid Blocks™, RAPid Plates™, RAPid Clamp Risers™ and RAPid Shims™ will save you time and money! No longer will you have to model, detail, check, program your CNC or laser to create these standard components. Just plop the model into your assembly and order it from us! 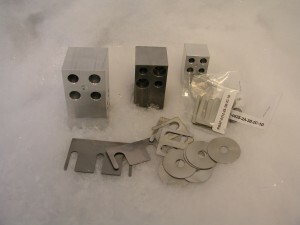 RAPid Tooling Components™ save you time and money. Look at our catalog to print the page you want or download the whole catalog. Sign up to receive our study comparing costs of standardized purchased components vs components designed and build in house. Coming soon!. WE ARE THE SHIM KING!!! Check us out! We cut hundreds of thousands of shims each year. RAPid Shims™, Naams shims, die cutting shims, bridge shims. Our Automated RAPid Order Processing System ™ allows you to get your quote and your order FAST and error free! Learn more…. Send us your drawing files for a quote. We accept AutoCAD DWG files. Call 414.355.5221 or email us with questions about your file format. Contact Us. Excellence in Machine Design: Our Zero Defect Engineering Process™ helps insure that the drawings we give you are as accurate as possible. If we make an error, we will fix the drawings free of charge. Shims: We guarantee our metal shims will be without burrs and as you ordered or we will replace them free of charge. RAPid Tooling Components™: Rentapen’s Automated Rapid Order Processing System™ insures that your order is as accurate as possible. If your RAPid Tooling Components™ including shims don’t arrive as you ordered them, we will replace the item free of charge. Rentapen Inc. was started in 1976 under the name of Straley’s Services in Rockford, IL. Yes! We actually used Electric Erasers and Slide Rulers! Initially George and Sue packed RAPid Shims™ on the Straley kitchen table. In the 1980’s it moved to Waukesha, Wisconsin. Moved to Pro/E 3D solid modeling and quickly became the EXPERTS. Helped John Deere and several other customers set up Pro/Engineer for Machine Design, automating the bills of materials, the hole creation, and start parts. We added icons and mapkeys, created the fastener and purchased parts libraries. We introduced major cost savings in weld fixture design with our line of RAPid Tooling Components™. In 2000 all Rentapen did was design machines. We were designing a lot of work holding fixtures and found we were designing in the same blocks, plates and shims over and over again. One day we got a call from a customer. We had made a mistake on a detail of a block we had designed. The drawing image showed that a hole came from the opposite side of the part, but the call out for the hole did not say, “OPP SIDE”. The customer was upset because they had made the block with the counter bore on the wrong side and it was going to cost them $100 to make a new one. So we standardized those blocks, plates and shims. Now that $100 block can be bought for less than $50. Our RAPid Tooling Components™ save our customers hundreds and even thousands of dollars per fixture in design and build costs. And because they are counter bored on both sides they are more versatile and detail mistakes like the one we made are eliminated. As we have grown we have developed our Automated RAPid Order Processing System™ that saves money and reduces order errors by taking orders straight from the order confirmation to the laser to the packing slip in a few short steps. Now at times, RAPid Tooling Components™ make up 45% of our sales. And that customer that called us about the error in 2000 has since instructed all their engineers and machine shop vendors that they must use Rapid Tooling Components™ in their designs when possible. They see clearly that Rapid Tooling Components™ save time, money, and reduce errors. We sell hundreds of thousands of shims each year. Our shims are used in work holding fixtures and weld fixture. We make die sharpening shims. One customer requested we paint a couple of the thicknesses so that the guys in the shop can tell the difference without pulling out the calipers. And we do that for them. We are here to meet our customers’ needs. They buy a lot of shims from us. We are in the business of satisfying our customers. Shim packs are individually packed and labeled for your convenience. The name Rentapen came from a slang term used in the 1970’s and 80’s. This was when engineering was done with a drawing board and pencils. (Remember those electric erasers?) When a company had more work than their engineering department could handle they would “rent a pencil”. When Rentapen incorporated it had started designing on computer and printing drawings with an ink plotter. Pens are more permanent than pencils. Hence the name Rentapen was born.